At first I thought it was some kind of sunroom–you know how obsessed I am with sunrooms! But the caption refers to the “dining room chairs.” And then I saw the fridge to the left and wondered…is it actually part of the kitchen? That sent me on a search to find out more about the room, and I came across Ann’s website. Oh, happy day! She has more photos of the room in her portfolio, so we can see the rest of it! It’s always interesting to see what’s been tweaked or changed for a professional photo shoot. The chairs are different, for one thing, and the rug is missing. In this one you can clearly see it’s a kitchen. A kitchen that looks like a sunroom. Love it! And on the other side of the room? A brick hearth. This bedroom got a big dose of her favorite blue-greens. She told the mag that she was “going for a playful look because my grandchildren sleep here.” Lucky kids! To see the article by Jody Garlock and photos by David Land, pick up the February 2013 issue of BHG. To learn more about designer Ann Rae’s work, visit her website. I’m crazy for that ceiling fixture over the bed. I am planning on painting the exterior body of my house turquoise next time it gets painted. With cream trim, and a burnt orange front door, it will be a refreshing change from the cream/green/brown colour scheme it currently has. I love looking at these comparison photos. I am envious of Janice above for being able to paint her house turquoise. Mine was clad in taupe colored vinyl siding before I bought it, which is probably good because I probably would have painted it dozens of colors already if it was wood. My front door is painted a dark turquoise. I was very taken by the front door, expecting a completely different look inside than is shown. I’m not a fan of the exposed dark beam look and I’d probably be the one people shout at for painting all that trim!! I understand the beams reflect the history of a home but it’s hard to pull off so the beams don’t control the overall color scheme of the room. As for the breakfast table: I much prefer her vision, without the rug and with chairs that blend in under the gorgeous long table. With the rug and all the turquoise chairs, the entire focus and feel changes. And not an improvement, for my eyes. 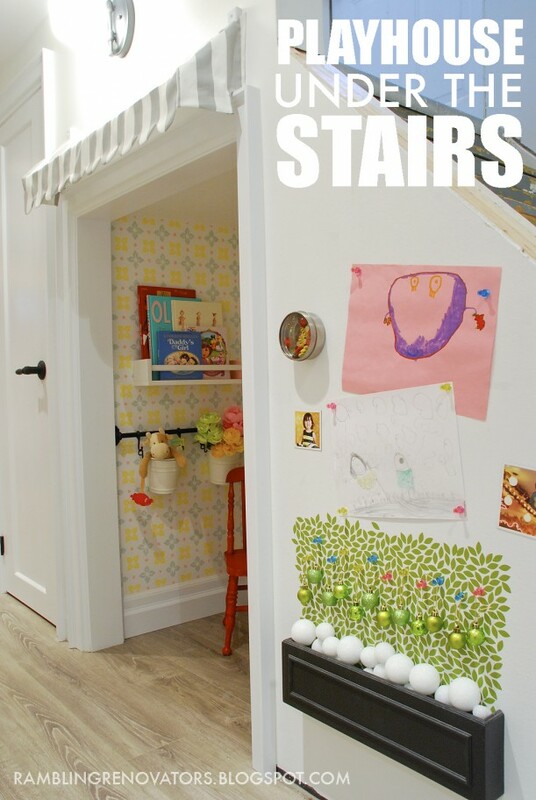 Turquoise can be such a fabulous color – the grandchildren’s room pulls it off nicely. Alas, my husband would likely balk at anything interior painted turquoise. Can you tell me the color of the front door? 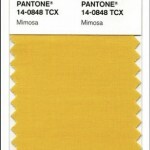 I love this color and would like to use it in a hobby room I plan on re-doing! Great house! Love her kitchen! Love this! 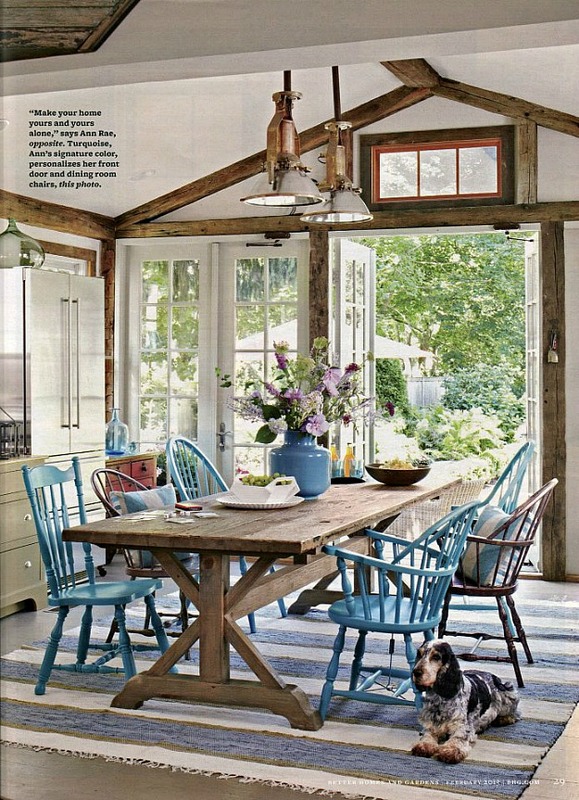 I like the turquoise Windsor chairs together with the stained chairs mixed with the old wooden farm table and rustic beams. Love this ‘eat-in’ kitchen and how it’s open to the outdoors. I prefer the look from the magazine with the addition of the striped rug. Don’t care for the Oriental (?) style chairs from the website picture. I painted the door to our cabin and our Amish style twig rockers a blue green (a little greener than true turquoise) that came out brighter than I intended, but I’m going with it. It really pops against our gray logs and ties in with the green metal roof. My neighbor thought I was going Caribbean! I happened to come across a picture of those same chairs (different finish) that are in her actual kitchen. They’re Hans Wegner’s 1949 wishbone chairs. So, I learned something. They still seem to have an Oriental influence to me, and I still like the Windsor chairs better. I’m just a traditionalist, I guess. I literally LOLed so loudly that I woke up the dog! I’m sure she thinks I’m nuts! very comfy, very calming. You just can’t help but love those doors opening to the gardens… not to mention that front door! This home is absolutely charming. Luvvvvv the beams, high ceilings, wonderfully bright windows, the open plan of the kitchen layout, the old brick surrounding the fireplace …….. A fireplace in a kitchen is number one on my list. Also……Luvvvvv the dogs. So cute….. It is a beautiful and welcoming home. I love it, and I bet she really enjoys and uses her kitchen. What a beautiful charming home. I love the rustic beams and the natural light coming through the windows. They give the home a peaceful and calming feeling. 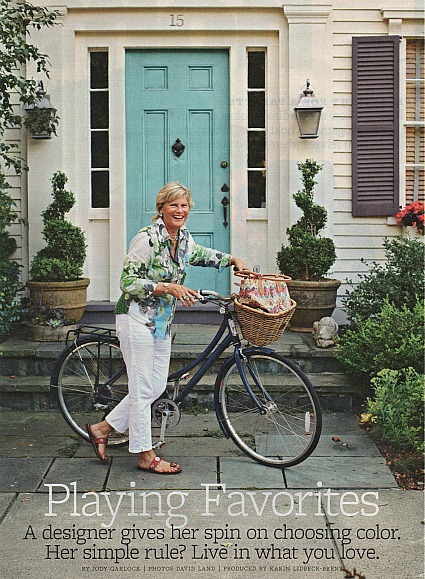 Ann Rae’s home was my favorite piece in the February issue as well. We have wood trim in our home which we can’t paint (renters), so I’m always on the hunt for ideas of ways to incorporate it as an element. I loved the kitchen table as well. . . . I loved the picture of the kitchen as well. Our kitchen has a similar layout, only nowhere near as pretty. Unfortunately, my husband informed me that I am not allowed to paint our chairs blue. He’s just lucky I’m lazy. I tried to find the light fixtures that are above the table and they are not listed on the website anymore. Plus the website doesn’t list prices, which I translate to never, ever being able to afford. Just read the magazine at my mothers house, saw the fridge and wondered about the layout as well. I hate when they only show bits and pieces of a kitchen and you can’t figure out how it works together. When I got home and pulled up your site I was surprised to see the rest of the kitchen. Thanks so much. I think the rug was for show only as it would only be in the way for everyday use of the kitchen. I think the chairs are probably hers, just a new addition since her website picture was taken. But a blue striped runner would be nice in front of the sink and could easily be taken up for cleaning. I don’t like the placement of the fridge it blocks the window but having a similar dilemma on where to place my fridge I don’t know where else it could go. Her living room didn’t do anything for me and where was the turquoise in there, why lavender and why two different patterned chairs that don’t compliment each other. I would have featured more pictures of the kitchen which is stunning and left out the boring living room. But what do I know, I don’t run bhg. I loved it and how personalized it is! I also started working on each room to make it spectacular and then realized I had so much I had to open up a shoppe! I just love Ann Rae’s house and decorating style, particularly the bedroom. As a dog lover, I loved the dog decorations scattered around. Did the resources page mention anything about the wooden pointing dog wall decoration in the bedroom? What a great house. I love the pops of color she uses in some of her rooms. Loved the bedroom. Did the resources page mention anything about the turquoise quilt in the bedroom in the February edition on page thirty five? I didn’t notice but I’m not sure where that issue ended up. I might have given it away already and only cut out the pages with photos. You can always look for it at the library, though! I am looking for the bedspread/quilt used on the bed In the turquoise bedroom. BHG said it came from fig linens but I haven’t found it on their website. I just painted my bedroom that color and would love either that same bedspread or something similar. Any suggestions?